Patrick Girigorie was born and raised in Curacao (Netherlands Antilles) well known as the ABC islands, which are a small group of islands near the coast of Venezuela, where approximately 150,000 people live. Patrick is a former professional volleyball player and was a coach for a womens volleyball team for more than 15 years. Patrick is a Wellness and Sports Massage therapist and a Certified Kinesio Technician. Now, he is the pitching coach for the Little league Softball Selection and our National Softball Selection of Curacao. Additionally, he is now organizing pitching clinics for young athletes, helping them reach their dreams. Curacao has always has been dominant when it comes to baseball, but now it is time to advance softball programs as well. 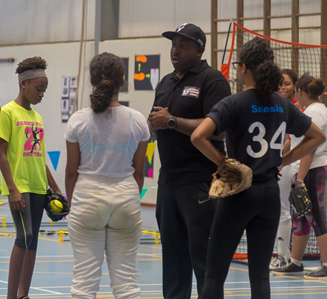 He is devoted in changing the softball pitching in Curacao, to not only have a better representation in the sport of softball for Curacao, but also give the young student athletes an opportunity to get scholarships in the USA or Puerto Rico as Pitchers. My whole journey started when my daughter decided she wanted to play softball instead of volleyball, and she wanted to be a great pitcher. Very soon I realized many pitching limitations we have in our country when it comes to the in-depth knowledge of this technique. This was when I started reading various books, attending clinics in the USA and watching a lot of videos on the pitching technique to help my daughter with her dream. Through the journey of helping my daughter, I was requested to take over the training of all the pitchers for the entire team. Of course, I knew all that I have read and researched wasn’t enough. I did feel that I had a lot of limitations and was not confident enough to be able to teach and train the young athletes the correct technique of pitching. Continuing my research, I found various links online leading to Tincher Pitching and came in contact with Denny who called me and became very interested in helping me to get the proper knowledge for teaching pitching. During my first trip to the USA for a clinic with Denny, it was a mind-blowing experience and soon it was clear to me the difference between the conventional way and the Fluid Dynamics technique. Instantly I could connect my understanding of the muscles work in a human body, especially the woman and the fluid dynamics technique. This raised my interest and curiosity and was willing to do whatever it takes to understand in detail what this style was all about. Now I found myself so passionate about this way of looking at the pitching technique. Now I am helping the whole country in changing the way we see pitching in Curacao. The pitchers that train with me are gaining the benefit of all this and are unleashing an incredible speed, power, and well-synchronize motion naturally. I started my study and certification process with the Tincher Pitching since 2016. I thank the organization of Tincher Pitching and Denny for building me to become a pitching instructor, for increasing my knowledge on the art of pitching, for raising my love for the Tincher Pitching way, and for providing the missing connection of what pitching is all about. I am much honored to be a part of the Tincher Pitching world.